The hardest part of your trip, aside from paying the credit card bill, will be picking and choosing which adventures you can fit into your schedule. Luckily, there are only two roads in and out of Anchorage: one to the north, and one to the south. So ride along with us, and determine which stops are worth making. First, let’s talk about the activities right here in Anchorage. Arctic Valley should be snow-free by mid June, and later in the summer it becomes a wildflower mecca. It is a gradual uphill climb that takes an average of 45 minutes. Flattop is a busy trail, but incredibly popular. If you are terrified of heights, this one is not for you due to the rock climbing portion at the end. It’s questionable with kids… see my blog post about our family’s Flattop excursion here. Tony Knowles Coastal Trail. Rent a bike or walk this paved, flat, easy trail. Kincaid Beach gets 5 stars on a sunny day. There is easy access off the Coastal Trail and it takes approximately 20 minutes to hike down to the “beach.” There is one steep part, but our kids navigate it without any issues so most adults should be able to as well. Great picnic stop, and bring a change of clothes because the kids will get messy in the mudflats! Alaska Zoo. Small zoo with some Alaskan animals (polar bears, grizzlies, caribou…) and you can see it all in a few hours. Imaginarium. Anchorage’s version of a children’s museum. Put it on your list if it rains. H2Oasis – our indoor water park. Put it on your list if it rains. A lot. 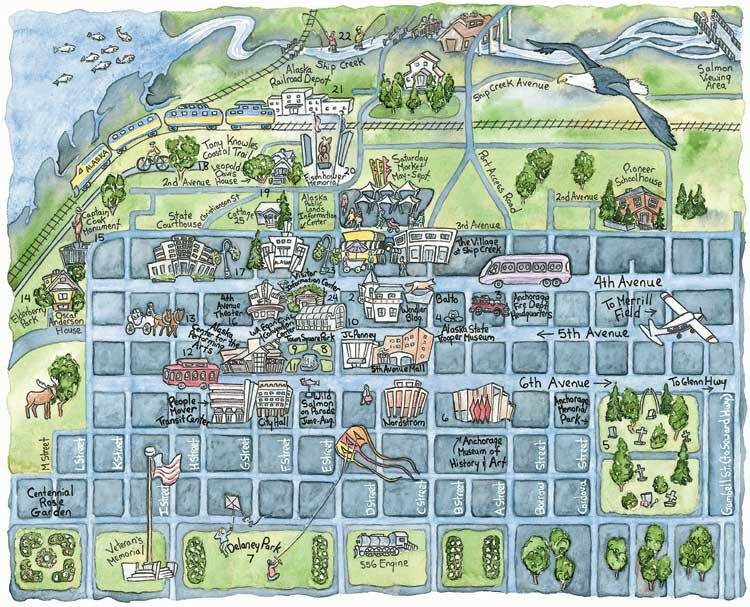 Anchorage Market & Festival – fun local vendors, food, and music. Last year there were several commercial booths mixed in – Pampered Chef to Tupperware – but there was still plenty of local arts and crafts. Flight seeing. Board a little plane and tour Chugach National Forest or Denali. It is pricey but incredible! Potter Marsh boardwalk – if you are a bird lover, this is a must-stop. Alaska Railroad. 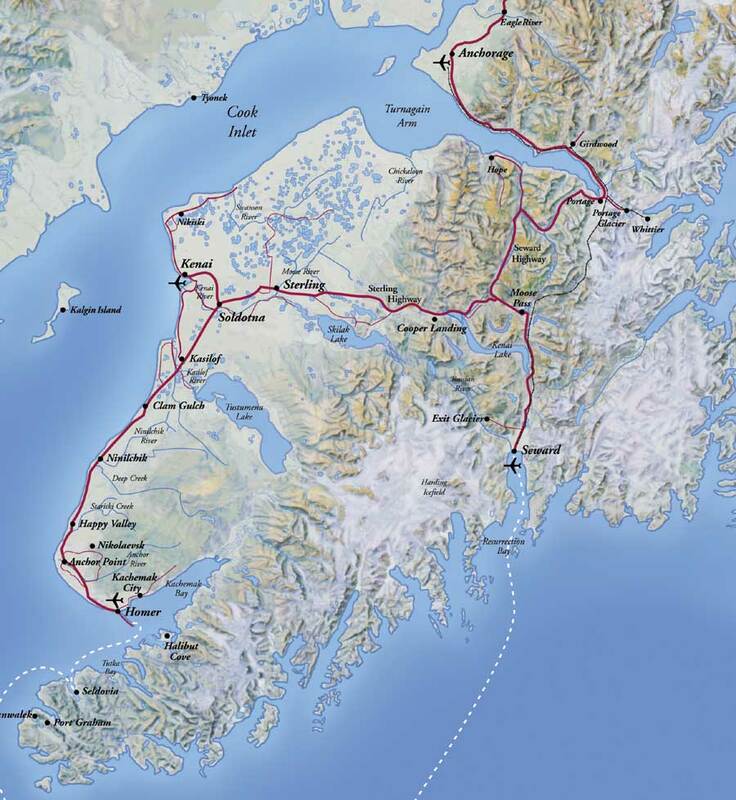 A great way to see the state – rail tours are available to Seward or Denali. Anchorage Museum. If you want to learn about Alaska history, art, or culture this is the place to do it. Alaska Native Heritage Center. This is more of an interactive museum. There are plenty of exhibits, but you can also chat with Alaska Native artists, dancers, and storytellers. You can also tour replicas of traditional Native homes. Watch the performances, or join in yourself! Downtown Day. Everyone who comes wants to spend an afternoon meandering around downtown looking for souvenirs and trinkets. Check the link to see if there are any special events while you are here. We really enjoy the Music in the Park concerts. When you’re ready to hit the road, let’s drive South on the Seward Highway. It has been a deemed a National Scenic Byway, so don’t forget your camera! 45 minutes south of Anchorage: Girdwood is a ski town with lots to do! Hike the Winner Creek trail. It is 3 miles, and at the end there is a hand tram where you pull yourself across an enormous gorge. It’s a great experience, but if you have rambunctious kids or a weak stomach for heights you might pass on this one. Take the aerial tram to the top of Alyeska ski resort. Paraglide from the top of Alyeska to Moose Meadows. Play at the amazing Girdwood park. It was hand-built by community volunteers and is probably the best playground we have ever visited. Eat at The Bake Shop (breakfast/lunch), Jack Sprat, Chair 5 or The Sitzmark. 1 hour south of Anchorage: Alaska Wildlife Conservation Center – a drive through wildlife park. 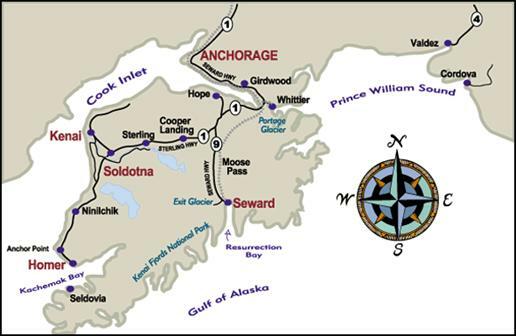 1 hour south of Anchorage: Portage Road, with access to many excursions. Portage Glacier tour – Note that this is on a lake – not out in the ocean! Byron Glacier Hiking Trail – an easy, flat 1.6 mile hike that offers a close up view of a glacier. Glacier/Whale Watch tours in Prince William Sound. Check into Major Marine or Phillips Cruises and Tours. Okay, let’s pretend we are back at the Seward Highway and didn’t turn onto Portage Road or head through the tunnel into Whittier. 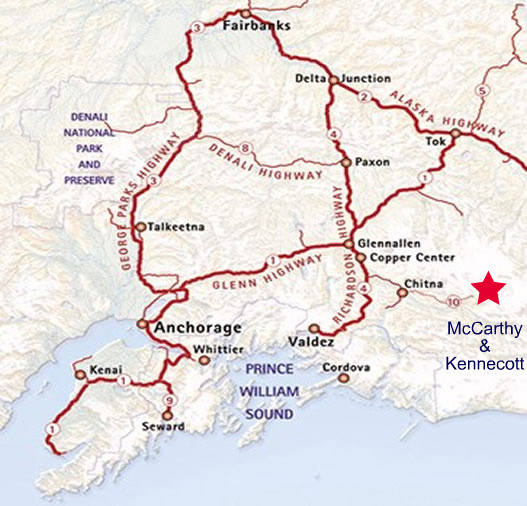 Keep driving south and soon you will cross onto the Kenai Peninsula… Alaska’s playground! 1.5 hour south of Anchorage: Sixmile Creek. Feeling crazy? Book a whitewater raft trip on a Class V river! Tito’s Discovery Cafe. Best veggie wrap I have eaten in my entire life. Amazing food! Glacier/Whale Watch tours in Kenai Fjords National Park/Resurrection Bay. Check into Major Marine and Kenai Fjords Tours. Or you can veer west onto the Sterling Highway. If so, many more adventures await you! Russian River Falls hike – time it right and you could see scads of salmon leaping, but beware of bears. They have been thick in recent years. Kenai River float or fishing charter. If we float the river, this is where we put in for our journey. 3 hours south of Anchorage: Soldotna. Kenai River fishing mecca. 4 hours south of Anchorage: Homer. This is the halibut fishing capital of the state. If you want to catch a giant white fish, this is the place to go! And with that, you’ve run out of pavement. So let’s pretend we are back in Anchorage, and take a cruise in the other direction. 20 minutes north of Anchorage: Eagle River Nature Center. Take a hike or rent a yurt for the night! Thunderbird Falls is a short, easy hike in a birch forest. 30 minutes north of Anchorage: Eklutna. Beautiful glacial lake with a hiking trail, as well as canoe and kayak rental opportunities. You can also visit the historic Native Village. 1 hour north of Anchorage: Reindeer Farm. Yes, you actually get in the pen with a herd of caribou, and they will accost you and let you feed them. Pretty fun stuff for the kids. 1 hour north of Anchorage: Hatcher Pass. We highly recommend this as a day trip. It’s an easy drive through the Talkeetna Mountains, and the road follows the Matanuska River. 1.5 hours north of Anchorage: Matanuska Glacier. It’s a gorgeous drive and you can actually walk out onto this glacier to explore. 2 hours: Eureka. If you go to Matanuska Glacier, I would continue on to Eureka. There are some amazing scenic vistas, and you can grab a snack at the Eureka Lodge before heading back to Anchorage. 3 hours from Anchorage: Glennallen. It’s a good spot to see the Trans-Alaska Pipeline, but otherwise just scoot through and enjoy some time in Copper River Basin. You are now close to the world famous Copper River Red Salmon and Wrangell-St. Elias National Park. 2 hours north of Anchorage: Talkeetna. Flight seeing from here. 5 hours north of Anchorage: Denali National Park. That’s just to get to the park. If you want to explore the park, you need to book a bus excursion (private vehicles are only allowed on the first few miles) or hike. To do Denali right, you should budget at least three days of your vacation. The buses are affordable and you have a good chance of seeing wildlife (moose, maybe bear) but beware that you only have a 30% chance of seeing that damn mountain. 7 hours north of Anchorage (Parks Hwy): Fairbanks. Phew. Exhausting, wasn’t it? Remember… you can’t do it all in a typical 1-2 week vacation. Weather is a huge factor, so keep your plans flexible and be ready to chase the sun. Let us know if you have any questions – we are happy to help!